Over the last three decades sports coaching has evolved from a set of customary practices based largely on tradition and routine into a sophisticated, reflective and multi-disciplinary profession. In parallel with this, coach education and coaching studies within higher education have developed into a coherent and substantial field of scholarly enquiry with a rich and sophisticated research literature. 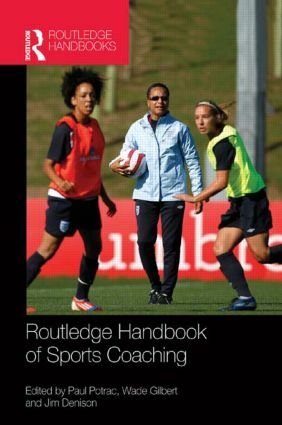 The Routledge Handbook of Sports Coaching is the first book to survey the full depth and breadth of contemporary coaching studies, mapping the existing disciplinary territory and opening up important new areas of research. Bringing together many of the world’s leading coaching scholars and practitioners working across the full range of psychological, social and pedagogical perspectives, the book helps to develop an understanding of sports coaching that reflects its complex, dynamic and messy reality. With more importance than ever before being attached to the role of the coach in developing and shaping the sporting experience for participants at all levels of sport, this book makes an important contribution to the professionalization of coaching and the development of coaching theory. It is important reading for all students, researchers and policy makers with an interest in this young and flourishing area. Paul Potrac is Professor of Sports Coaching at Edge Hill University. His research interests focus on exploring the social complexity of sports coaching, with a particular emphasis on the political and emotional nature of coaching practice. Wade Gilbert is a Professor and Sport Psychology Coordinator in the Department of Kinesiology at Fresno State University, USA. He is an active researcher and consultant in the areas of coach education, coaching effectiveness and athlete talent development. Jim Denison is an Associate Professor in the Faculty of Physical Education and Recreation, University of Alberta, Canada and Director of the Canadian Athletics Coaching Centre. A sport sociologist and coach educator, his research examines the social construction and historical formation of coaching 'knowledges' and coaches' practices.